Hamilton Beach has two electric knives that are popular, the Hamilton Beach 74250 Carve 'n Set and the Hamilton Beach 74275 Chrome Classic. We'll take a look at both these electric knives and see how they stack up to each other and to electric knives in general. 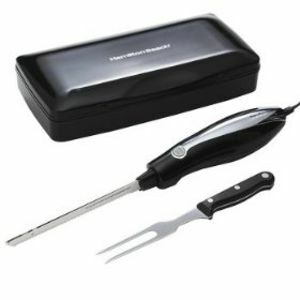 The Carve 'n Set has dual 7.5" stainless steel blades and comes with a case for storage and a carving fork. The motor is also 100 watts, which is a good level of power. The Chrome Classic has dual 8" stainless steel blades and comes with a case for storage and a carving fork. The 8" blades on the Hamilton Beach electric knives are a decent size, though we prefer the large 9" blades that both the Cuisinart and Black & Decker electric knives have. The storage case is very nice but can be tricky to open until you get the hang of it. Hamilton Beach Carve 'n Set Electric Knife: Despite a few issues the Carve 'n Set performs rather well. The motor is powerful enough to get through most breads and meats without too much effort and it seems to be pretty durable. The only complaints about the Carve 'n Set were that the blades tended to be too far apart, which can result in shredding the food you're cutting. It also has a large, uncomfortable handle which can get slippery if it gets water or grease on it. Hamilton Beach Chrome Classic Electric Knife: The performance of the Chrome Classic was very suspect and it had several issues. The motor on this Hamilton Beach knife is very loud and overheats quickly. The trigger is awkward to use and becomes slippery very quickly. The blades are also unbalanced and tend to wobble, making it impossible to cut thin slices of anything with the Chrome Classic. We would definitely recommend the Carve 'n Set over the Chrome Classic. The Hamilton Beach Chrome was just a poor knife and does not belong in your kitchen. We did like the Carve 'n Set, though we still prefer the Cuisinart CEK-40 or the Black and Decker EK700 electric knives, they have bigger blades and are a little more balanced.